Making Chinese or Vietnamese food always has me a little nervous. I tend to veer towards more European dishes when I put something together because the standards are high for Asian cuisine. My mother cooked every single day when I was growing up and still does. As most people would say, no one can beat mom's cooking so when I decide to attempt anything Chinese or Vietnamese, I don't believe it can be anywhere near as good as mom's. Therefore, I opt for dishes that she has made before or just doesn't make often. 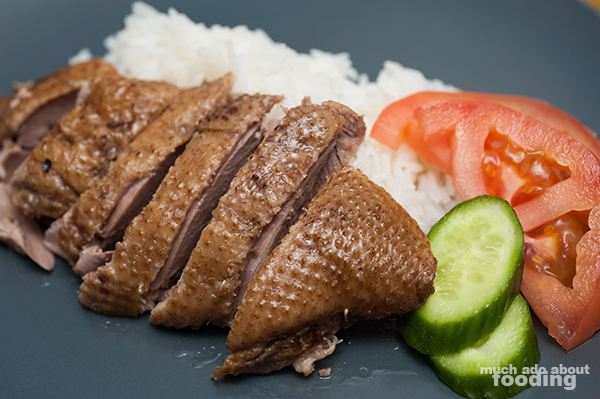 I had a whole duck to play with one evening and decided to make something Teochew (my particular Chinese heritage). I saw a recipe for braised duck ("lo ack"/滷鸭) so wanted to work with that. My mom knew what it was but hasn't really made it before...and she approved! Huzzah! So below is the tweaked recipe that is Teochew mother-approved. Rinse duck thoroughly inside and out. Pat dry before rubbing salt all over the outside and inside. For lemongrass, use only the bottom half and make sure to bruise by smashing with the blunt side of a knife. For fresh galangal, break with one hard smash of the knife - this will allow its juices to release during cooking. Combine all remaining ingredients into a wok. Bring liquid to a boil. Then reduce heat before slowly lowering duck into the vessel. If the liquid does not come up halfway on the bird, add additional water. Spoon liquid over the duck every five minutes for the first 20 in order to keep even coloration. 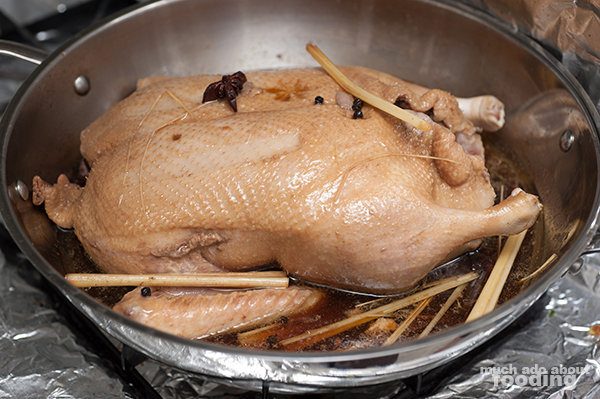 Cover afterward and simmer 45-60 minutes, turning the duck over every 15 minutes. Use a meat thermometer in the thigh (don't hit bone) to make sure the meat is at 165°F before turning heat off. 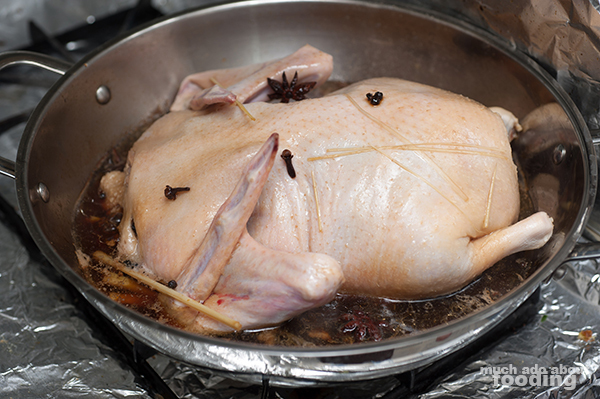 Let duck sit in its own juices for an hour with the cover on. When it is ready to serve, chop up duck accordingly. Drizzle some of the braising liquid over the plate with the duck, and leave a bowl out for those who want a little more sauce to dip the meat in!